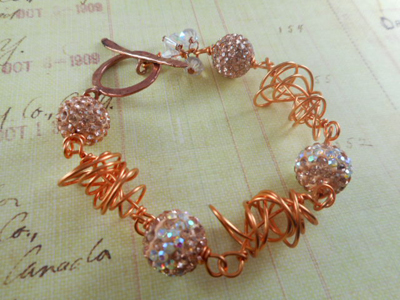 Create this fun bracelet using 20 gauge wire and sparkly pave beads. Cut a 13 inch piece of wire and make a wrapped loop on one end. Make a second wrapped loop 3/4 inch from the neck of the first loop. Wrap the wire around and around until you use up all the wire. Keep the loops messy and loose. Curl the end of the wire and tuck it toward the center of the link. Wire wrap a Pave bead and link to one end of the messy wire link. Continue linking beads and links together to form a bracelet or a necklace.